The Green Bay Packers and New York Giants will close out a week of great playoff football on Sunday, January 9th. Their game kicks off at 4:40 p.m. ET in chilly Green Bay. Many believe this game is a toss up and could be decided by numerous factors and it’s tough to disagree. Both teams are solid and have played quite well of late. Don’t miss out on one of the best games this weekend and get your Giants vs Packers live stream before kickoff! Even though the game comes on FOX you’ll still have multiple options to stream it live. Even without cable, you can watch it live streaming on your TV and can even watch for free in a couple different ways. Check out the below guide to learn more and get your setup ready for game time! DIRECTV NOW will be a good option to get a Giants vs Packers stream. There are many channels included in the starting package and in certain locations, you’ll get FOX live. You can sign up for a weeklong free trial to watch all of these channels and a Giants vs Packers stream free on DIRECTV NOW. This is the ideal way to figure out if the service works for you while still watching every second of the NFC Wild Card game live streaming. We have a DIRECTV NOW review, which will give you even more information on the service! 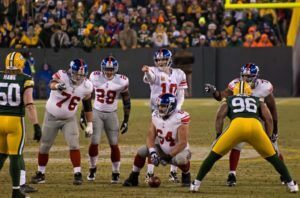 Another streaming service, Sling TV, is a great way to watch Giants vs Packers online. The service only cost $25 per month for the Sling Blue package. This one has over 40 channels to stream and will have FOX available live in specific locations. There won’t be a lack of things to watch, even if FOX isn’t available, as the package contains channels like FS1, NBCSN, TBS, TNT, CNN, AMC, and much more. Sling TV (review) is actually another good way to watch a Giants vs Packers stream free. There’s a weeklong free trial, so you can try out the service no strings attached. If you decide to sign up for just one month on Sling TV, you’ll receive a free Roku Express. This will let you watch a Giants vs Packers live stream right on your TV through the service. The last streaming service that’ll give you a Giants vs Packers live stream is PlayStation Vue. Sony’s streaming service has a $29.99 per month price tag to start. If you’re in an area that gets FOX live, you’ll likely see a price of $39.99 per month to start. This does include over 60 channels and offers features other network channels like CBS, NBC, and ABC. The one thing to note on PlayStation Vue (review) is you might not be able to stream from your phone. If you’re outside of your home you might get blacked out on certain channels. This could be a big deal for some, but overall PlayStation Vue is a great option for an NFC Wild Card live stream. The NFL’s streaming service, NFL Game Pass, doesn’t offer live games but does let you watch every single game right after it finishes. This is a perfect service if you miss the game or you know you’re not going to make it to a TV in time. It’s a lot cheaper than some of the expensive DVR services and costs $49.99 for the rest of the season. It’s tough to pick a favorite for this game. Some think the Packers win in Week 5 is a sign they should be favorites, but the Giants have improved greatly since then. Others say it’ll come down to a matchup between Odell Beckham Jr. and the Packers cornerback LaDarius Gunter. But, that’s not accounting for Aaron Rodgers MVP-caliber play of late. Regardless of who wins this should be a great matchup.